A birder from Houston and I were talking when she spotted this Gray Catbird on about 75 feet away on the other side of the lagoon from where we were sitting. Due to our distance from it we could watch it as it went about foraging out in the open near the water. The only ebird sighting for it at this location was Jan 7 but with it could go long periods without being seen in the vegetation at this area. In addition to the commonly found Orange-crowned Warblers I saw a Black-and-White (above), Nashville, and multiple Yellow-rumped Warblers. I spotted the Long-billed Curlew (below) all by itself on the ballfield turf in the city park area in which Edinburg Scenic Wetlands are located. I birded Anzalduas County Park, a Lower Rio Grande Valley birding hotspot, last Friday and I returned today to recheck one section that was quite birdie. 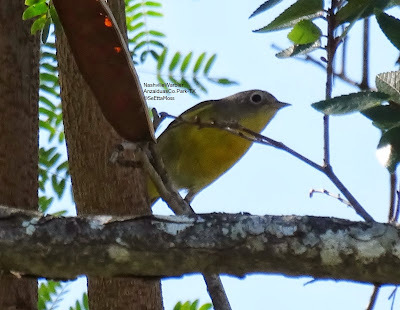 Today I found this Nashville Warbler, a species that apparently winters in this area and that I saw at Edinburg wetlands two weeks ago, but I haven't heard of one reported at this location. I was told by a birder from Canada that there were 2-3 Black-throated Gray Warblers there but I only saw this one that enjoyed a refreshing bath when the temps were in the 80's. I saw this Brown Pelican there both on Friday and today--it has been reported for some time along the Rio Grande River that curves around this park. As this is inland, this pelican is considered a rare sighting. Today the winds got strong so the pelican sought a sheltered location around this old dock. 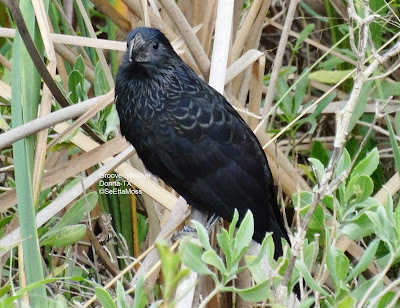 Yesterday I refound the Groove-billed Anis in the Donna Reservoir area. They had moved from the taller vegetation adjacent to the fallow ag fields to the cattails and other plants in a ditch with a little water in it. 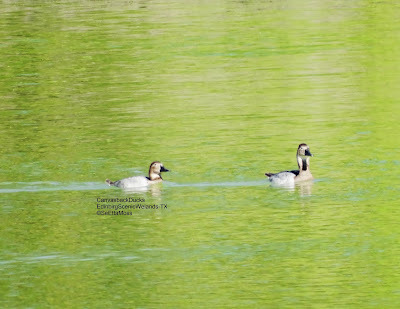 I watched them for about 15 minutes as they flew mostly through the vegetation and vocalizing to each other. While I was watching 3 of them at least partially visible I could hear at least one more a little further down the ditch so there are at least 4 in this group. Yesterday I spotted a Zone-tailed Hawk perched at mid-day in the thicket at Frontera Audubon in Weslaco, TX. I did not get a usable photo as the hawk flushed right after I got a reasonable look at it. So when I returned at dusk to see if this hawk would return to roost I tried to be even more careful as I try hard to avoid flushing perching hawks and especially if they are likely going to roost. I didn't find it at Frontera but in the area. 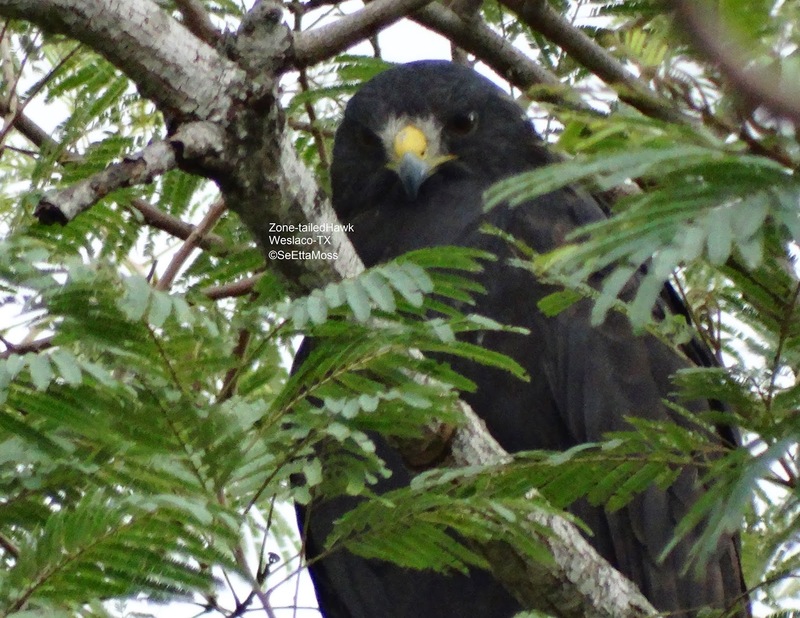 Darn this is a spooky bird--with a split second after I spotted it, this hawk spotted me and flushed again. Arggh.